Technology is evolving faster than ever these days. Companies depend on information technology to keep their businesses running. Keeping up with technology is vital for any company that wants to sustain a competitive edge. It is recommended that business computers be replaced every three to four years. The typical desktop computer has little market value after four years and is most likely no longer covered under warranty. Hardware and maintenance costs can also add up quickly. Buying new computers can be a huge expenditure for small start-up companies on a tight budget. Computer leasing addresses all these factors and offers a strategic, competitive opportunity for businesses. Computer leasing is a great alternative to purchasing new technology equipment. Leasing equipment allows you to regularly upgrade your computer and software equipment on a regular basis. This means you will no longer get stuck working with equipment that is out-of-date. Just as technology changes, human’s expectations change. People and businesses want an instantaneous response. At Tiger Leasing, we believe you shouldn’t have to wait around for funds to become available, time is money after all! Leasing computer equipment does not require a large down payment; instead, the money owed is spread out over affordable, monthly payments depending on the leasing program you’ve chosen. 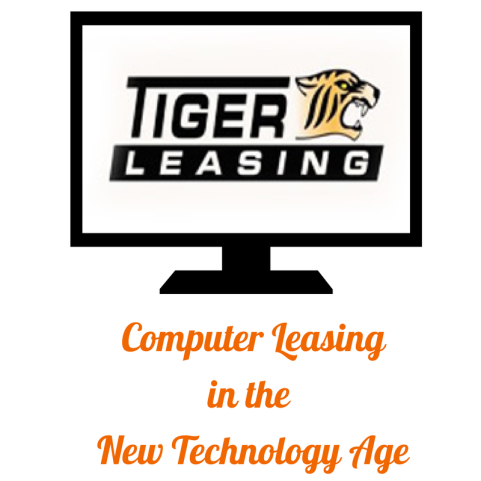 Not only does computer leasing allow you to stay competitive, at Tiger Leasing, our agreements provide 100% financing on computers and software. You can also include maintenance and training into your finance package, so that you and your staff understands the powerful new technology you’ve acquired and how to best utilize it for your business and customers. When you are forced to buy computer equipment because of a breakdown or virus, typically it is something inexpensive that will get the job done “right now.” Businesses that lease are thinking long-term and planning for the future based on their customers’ evolving needs. Keeping up with technology may be difficult, but choosing not to keep up could be fatal to your business. Computer leasing is easy, affordable and effective for every business venture. If you are considering leasing new technology equipment fill out our online application form or contact Tiger Leasing for more information. 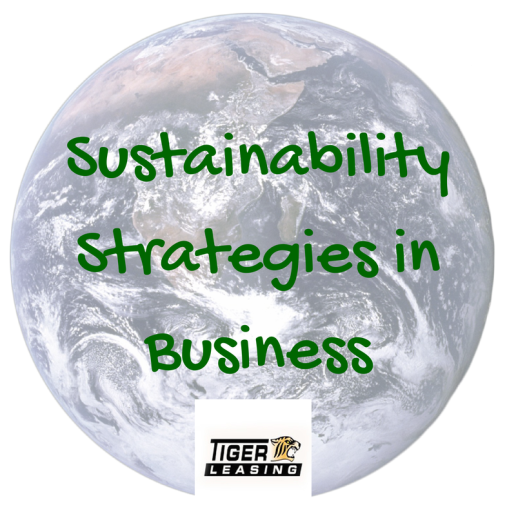 Sustainability strategies have been growing in popularity over the past few years. Managers are looking for ways to decrease costs and still deliver quality products through sustainable practices that will keep customers coming back. Companies that want to continue growth and profitability should look into becoming sustainable. Here are a few small tips on ways your company can enforce sustainable strategies. Sustainability has different meanings to different people. It is important to define what sustainability means to your business. Once you’ve defined sustainability, write down your goals and what you’d like accomplished as part of your sustainability strategy. Make sure you have the backing of your senior management before carrying out suitability initiatives. If they understand how sustainability practices affect their responsibilities they are more likely to back you up. Get everyone on board with your sustainability goals: employees, suppliers, investors and customers. Explain to them how your sustainability goals will help the company in the long-run and how it will benefit each of them. This is something new for your business. Remember there will be a learning curve. Do not get caught up trying to do everything at once; even the smallest changes can make a big difference. Keep everyone in line with your sustainability strategy. Make sure your strategy is clear and that employees and customers understand the benefits of these sustainable practices. It is important to measure your success in terms of profit and less tangible areas as well. Sustainability creates long-term value. It may be an uphill climb, but don’t surrender, sustainable businesses are often more efficient in the long-run. Sustainability is a great decision for businesses, the environment and society in general. No matter the size or industry of your business, implementing sustainability strategies is a great movement towards long-term success. Equipment is a necessary part of running a business. Equipment can be owned, bypassed or leased depending on the business’ size and industry. It is not uncommon for businesses to lease their equipment from an outside vendor. Studies have shown that over 80% of businesses lease at least some of their equipment. Equipment leasing is a great alternative to taking out a loan, especially for businesses that have limited capital and will need to upgrade every few years. Lease financing offers exceptional advantages from lower monthly payments, tax advantages, conservation of working capital, fixed financing rates and no hefty down payments. Equipment leasing also gives companies access to the most advanced technology and software on the market. What are the options for upgrading equipment? How long will I need the equipment for? Does the leasing vendor include soft costs such as service, supplies and training? How much experience do the individuals have in the leasing business? What are the terms and conditions at the end of the lease? It is important to study the lease agreement carefully before making any decisions. 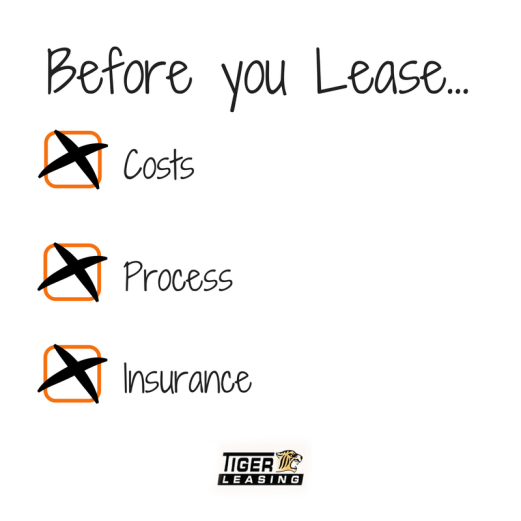 Equipment leasing companies such as Tiger Leasing can provide customized programs for any business. At Tiger Leasing, we act as partners that provide you with financing solutions to give you the equipment you need. If you have any questions about leasing comment below or visit us online to learn more about the benefits of leasing.